Like many existing programs, WordPlay-- Vancouver Poetry House's poets-in-schools program-- was dismayed to learn that despite receiving funding from the Canada Council in the past, their application was denied this year. LitLive profiled WordPlay in issue five's feature article. So now they've turned to IndieGoGo to crowdsource the funding they need to staff the program. You can help them out here: http://www.indiegogo.com/keep-wordplay-in-schools?c=home. As with all IndieGoGo campaigns, supporters receive perks, based on the value of their donation. 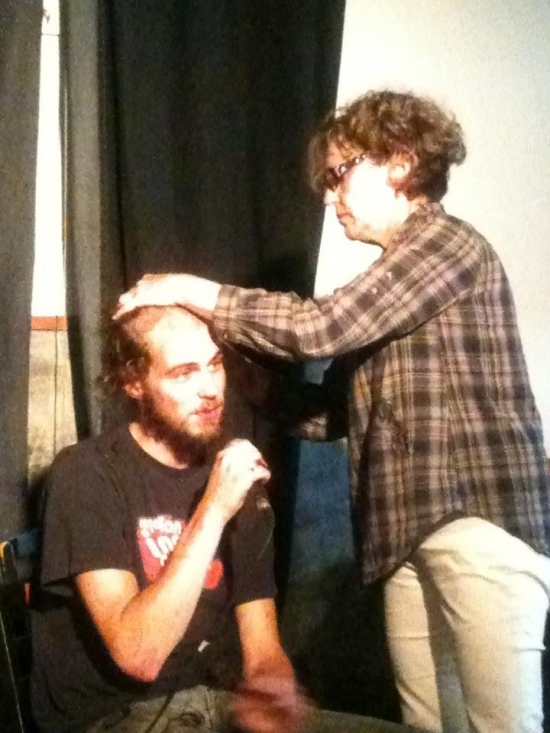 Last month at Vancouver poetry slam, one contributor collected their perk live onstage: shaving poet Johnny Macrae's head! The donator just happened to be one of Johnny's biggest fans and critics-- his mother. We hope you can support this very worthy cause.